We all know the drill: Reduce, Reuse, Recycle. Except, of course, that by and large Malaysians continue to be laggards when it comes to recycling. Only a mere 15% of solid waste was collected for recycling all of last year. Perhaps a solution to all those growing mounds of non-biodegradable plastic bottles, containers and bags around the nation can come from an unlikely source: bacteria. A team of researchers at Kyoto University report in an article in Science magazine that they have isolated a strain of bacteria that can “break down and metabolize plastic.” That’s right: they have found bacteria that love to chow down plastic. 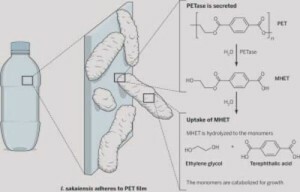 The Japanese researchers spent five years examining 250 samples taken from a plastic recycling facility in the Japanese city of Sakai before they isolated a new species of bacteria – Ideonella sakaiensis – that could live on the most common type of polyester, polyethylene terephthalate (PET), which is widely used in bottles, containers, packages, synthetic clothing and other consumer products. It isn’t the first time that plastic-eating microbes have been discovered and hailed as the potential new heroes of our rubbish-strewn planet. During an expedition to the Amazon a group of researchers from Yale University in the US discovered a fungus, pestalotiopsis microspora, that can break down polyurethane, a commonly used industrial plastic. They reported their findings in a 2012 article in the journal Applied and Environmental Microbiology. However, the fungi would be hard to cultivate at an industrial scale, which would make them unsuitable for the large-scale disposal of plastic waste. Not so with the newly discovered bacteria. 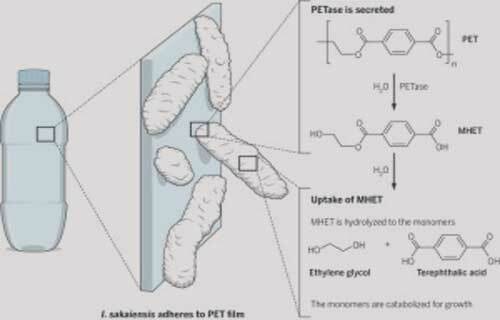 All the Japanese scientists needed to do was leave the bacteria in a warm jar along with polyethylene terephthalate and some other nutrients, and within a few weeks they disposed of all the plastic without a trace. Plastics have been around for 70-odd years and that has been enough for Ideonella sakaiensis to have evolved the ability to produce an enzyme for breaking down and digesting PET. Better yet, the researchers have been able to produce the same enzyme on their own for breaking down PET even without the help of the bacteria.